Maddie Pearlman is a third year law student at the University of Manitoba in Canada. Maddie has been working with community organisations on refugee issues for the past five years including as a youth support worker with the Immigrant and Refugee Community Organization of Manitoba. She is currently the project coordinator for law students assisting refugee claimants, who are coming to Winnipeg, Canada from the United States, with their asylum claims. Maddie holds a B.A. in Human Rights from the University of Winnipeg and a MSc in Refugee Studies from the University of Oxford. 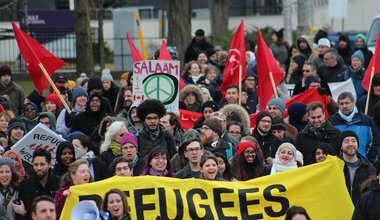 Efforts in Canada to provide safe passage for refugees prove that people power can not only shift public policy, but also save lives.